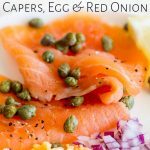 If you are looking for ideas for a Super Easy Appetizer then this Smoked Salmon with Caper and Hard Boiled Egg is perfect. It is elegant and so easy! 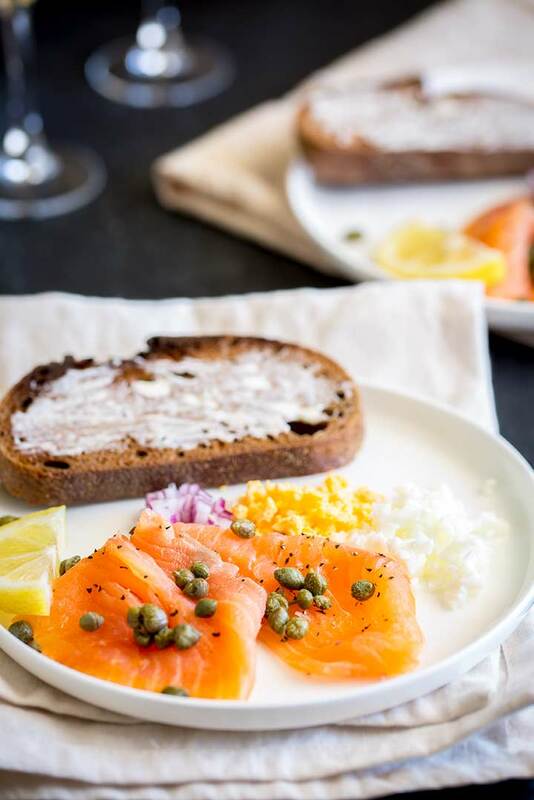 It can be individually plated up or served on a platter plus it is easy to make this gluten-free or to leave off the bread and make it paleo and keto. All the prep can be done in advance and it takes minutes to put together. Perfect for Easter or Christmas. I struggled with what to call this dish, it isn’t really a smoked salmon salad, but smoked salmon appetizer covers so many variables and doesn’t accurately describe the dish. I think platter is the best way to describe it. This dish is more of a mini smoked salmon platter. Individual items served together for your friends and family to load onto a slice of bread (or into a lettuce leaf for Paleo/Keto). Everyone can add what they like to their bread and enjoy it their way. 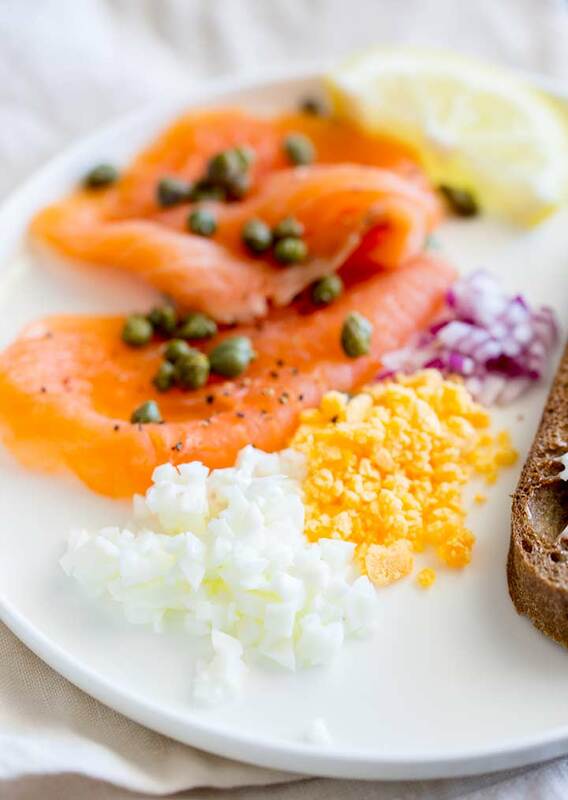 The dish is a simple platter of smoked salmon scattered with capers, served with hard boiled eggs and red onion. The hard boiled eggs are separated into whites and yolk, giving a great visual appeal and alternative textures. I have what I think is a foolproof method for cooking hard-boiled eggs. This method ensures perfectly cooked whites, just set yolks with no horrid green ring and makes the eggs easy to peel. Use a pan big enough to hold your eggs easily, but don’t go too big so the eggs have space to jump around. Take the eggs from the fridge and leave them on the counter to warm slightly. Pour water into the pan and bring it to a boil. Once the water is boiling reduce the heat to the barest of simmers and use a skimmer or slotted spoon to add the eggs to the water. Turn the heat back up and set the timer for 13 minutes. Whilst the eggs are boiling get a bowl of well iced water ready. As soon as the timer goes use a slotted spoon or skimmer to remove the eggs from the boiling water and drop them straight into the ice bath. Let the eggs cool for 5 minutes then gently crack the eggs and the shells should slide off. 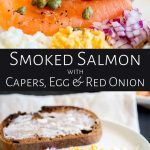 What to serve with the Smoked Salmon, Capers, Egg and Red Onion. For those following a standard diet, you can serve this with bread; rye bread, crusty bread or toast points all work well. If you are serving this as a gluten-free appetizer, then use a gluten-free bread. As gluten-free bread is often drier you might want to serve it as buttered toast. Alternatively, you could follow the ideas below for keto/paleo. For Keto/Paleo diets you can serve this with small lettuce cups or with slices of roasted sweet potato. You will find smoked salmon in the refrigerated section of the grocery store. The selection is usually pretty good and ranges from farmed salmon to wild salmon. You can also buy smoked salmon offcuts which are great for pasta dishes like my Smoked Salmon Pasta, but really no good for this dish. With this simple dish, you want the salmon to be served in elegant long slices. So go for the best you can afford. Once you have bought your salmon, get it in the refrigerator at home as soon as possible. Unopened salmon will keep for two to three weeks. Once opened aim to use your salmon within 3 days, although it is usually good for 5 days. Yes, smoked salmon freezes surprisingly well. The best way to do this is either sealed in the original unopened package or if you have an opened package, wrap it tightly with glad wrap before freezing. 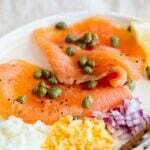 In the deep freeze smoked salmon will last for 3 months without any loss of flavor or texture. Defrost in the refrigerator and use within 24 hours of defrost. 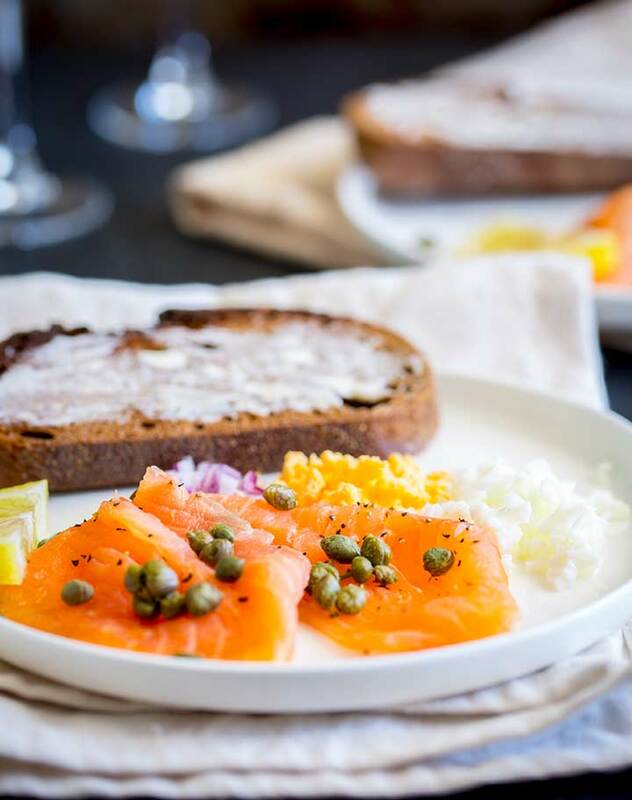 The classic pairing of Champagne or Prosecco works perfectly here or a well chilled Viognier will enhance the creaminess of the egg yolk and can also stand up to the smokiness of the smoked salmon. A dry Sancerre would also be a great option. Or if you want to go for something a little different, try a dry sherry, the tang and salty notes are just perfect with smoked salmon and egg. Just be sure it is well chilled. Or have a go at curing your own salmon with my Blueberry, Gin and Dill Cured Salmon. 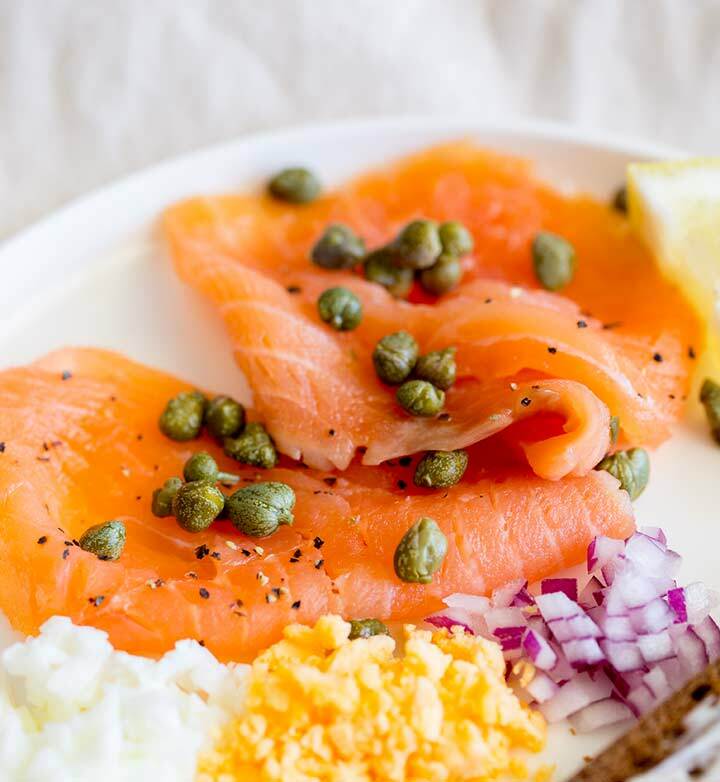 Pin this recipe for Smoked Salmon with Capers, Egg and Red Onion. Pin it here. 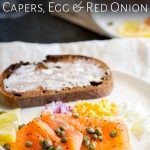 If you are looking for ideas for a Super Easy Appetizer then this Smoked Salmon with Caper and Hard Boiled Egg is perfect. It can be individually plated up or served on a platter plus it is easy to make this gluten-free or to leave off the bread and make it paleo and keto. All the prep can be done in advance and it takes minutes to put together. Perfect for Easter or Christmas. Start by cooking the eggs. Use a small pan that fits the eggs. Remove the eggs from the fridge whilst you bring kettle of water to the boil. Pour the water into the pan and bring back to a boil. Once boiling reduce the heat to a simmer and carefully use a slotted spoon or skimmer to lower the eggs into the water. Seperate the yolks from the whites, then finely chop the yolk and set to one side. Chop the egg whites slightly larger and set to one side separately to the yolks. At this point everything can be covered and kept in the refrigerator for a few hours. 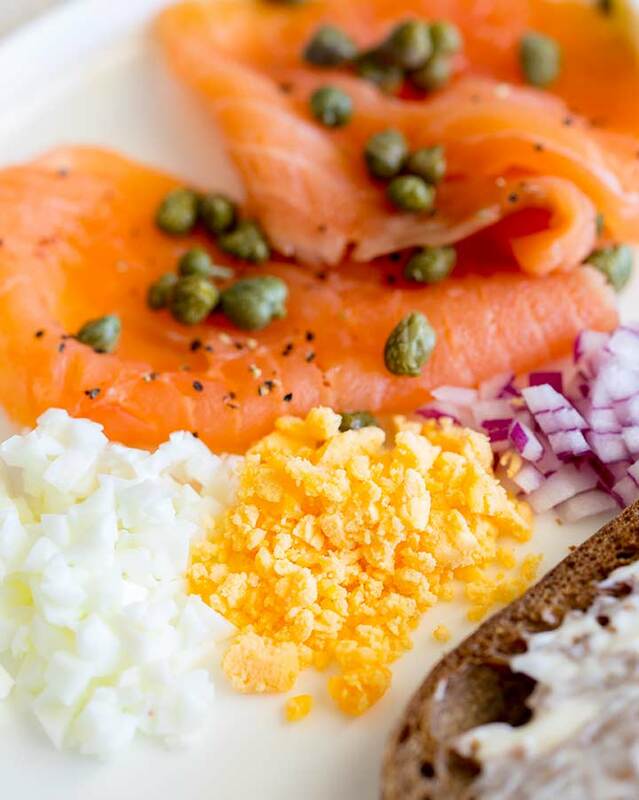 Add 2 slices of smoked salmon to each plate, a small pile of egg white, egg yolk and chopped red onion. Scatter over the capers, then squeeze over a little lemon juice and season generously with black pepper.